This hair styler makes your hair smooth and it provides a power hold and a soft touch like cashmere extra care for dry and damaged hair without stickiness. Schwarzkopf Taft Power Hair Spray Mega Strong fixation throughout the day. Hair elastic as cashmere. Extra care for dry, stressed hair. Hair and do not stick easily brushed. 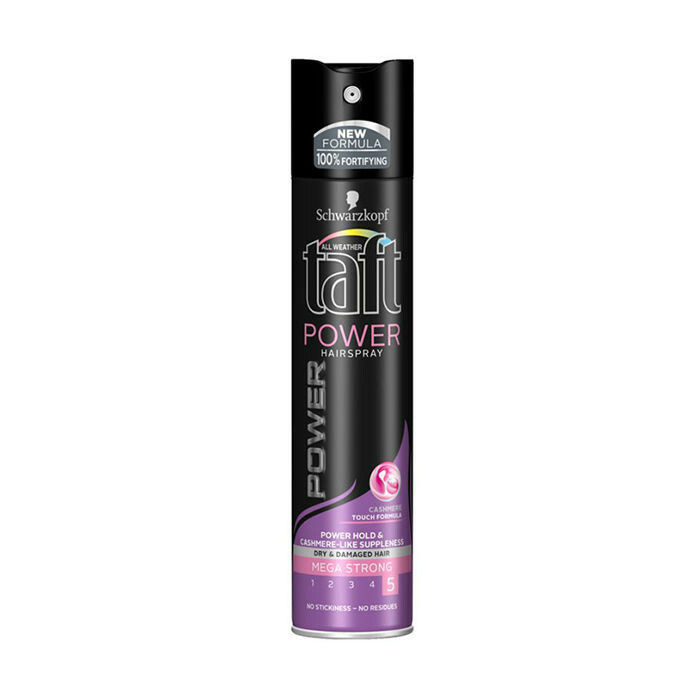 The first to appear on the market an innovative line of Taft Power, which gives the hair a real flair.The hair lubricated without being influenced greasy to the touch. New fortifying formula Taft Power with caffeine breathes new life into your hair with such energy, strength and endurance that you can enjoy a perfect hairstyle that really lasts.Schwarzkopf Taft Cashmere holds hair in place all day, even in humid weather. Taft acts as a firm foundation with flexibility. With 24-hour long lasting formula and the sense touch effect formula ensures hair is soft to touch.